Q: How can I use Goldie to create a compiler? Q: Why the name "Goldie"? Q: How do I refer to a rule that has no subtokens? 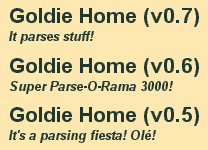 Q: Can Goldie parse the D language? Q: I'm getting "Ambiguous symbol" errors! Q: This project sounds very similar to Gazelle. What's the difference, and which one is better? Q: What about Goldie vs. ANTLR? Q: Are these questions really frequently-asked? A: This is not an easy task no matter what parsing tool you use. To get started, see the Never Used a Parsing Tool? page which contains an overview of everything involved in creating a full compiler. In summary: Use Goldie to implement a lexer/parser (see Goldie Overview and the Beginner's Tutorial), and then, just as with any other parsing tool, you'll have to do your own semantic analysis on the resulting tree, and then implement a compiler backend. A: "GOLD for D" -> "GOLD D" -> "Goldie"
A: Use null for the list of subtokens. For details and examples, see Referring to a rule that has no subtokens on the GoldieLib Overview page. Short answer: Lexing: Mostly, yes (see the included dlex.grm). Parsing: Not yet. Long answer: See this newsgroup discussion thread. A: GOLD/Goldie and Gazelle are both members of a new class of generic parsers that focus on fully-reusable grammars that aren't tied to any particular host language. They both accomplish this by completely separating the grammar from the parsing engine. A: While Goldie and Gazelle are in roughly the same class, ANTLR is very different in that grammars are not independent from the host language. Yes Yes No. Typically, the entire ANTLR and StringTemplate projects must be ported. Yes Yes Typically, no. The embedded code must be ported.